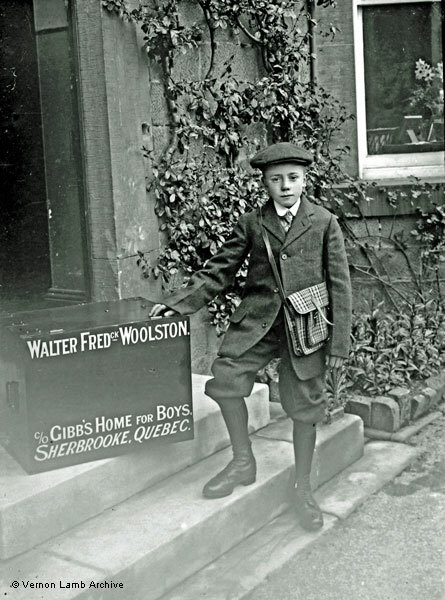 Description/Historical Information: Walter Fredck Woolston c/o Gibb's Home for Boys, Sherbrooke, Quebec. Walter is standing on the steps of St. Andrew's Home, a Church of England Waifs & Strays home, with the box he had almost certainly made himself. He was born in Lambeth in 1900, the son of Arthur and Alice Woolston. By 1911 he was boarding at Troston, Bury St Edmunds with the Matthews family. He left Liverpool on the Victorian on 29 April 1914 as a 3rd Class passenger to land at Quebec (Contract ticket no.57768). There were many boys of the same age on the ship, including a few from St. Andrew's [also see VLA4868, and VLA5230 and VLA2536]. A group picture of those going to Canada was picture was published in The High Peak News of 4 Apr 1914.
elsewhere on this site: Cliffe House in the 1901 census, when still lived in by Ernest Henry Bailey.